In the next series of blog posts, I will explore common simple and more complex Building Codes. Each City has adopted a code but most in Arizona use the IBC (International Building Code). Exit corridor width. How wide or narrow can a hallway be? Door fire ratings. Is your door fire rated? Minimum size of a single person toilet room? The item in bold to be addressed in this post. As an Arizona Architect, most City’s jurisdictions work with the IBC (International Building Code). The code analysis is based upon the IBC. A buildings exit pathway typically consists of and exit pathway with hallways containing doors from offices, restrooms, mechanical rooms, leading to the exterior. In certain scenarios, the doors can swing either in or out. In some cases, functionality within the space dictates a swing direction unless code overrides. 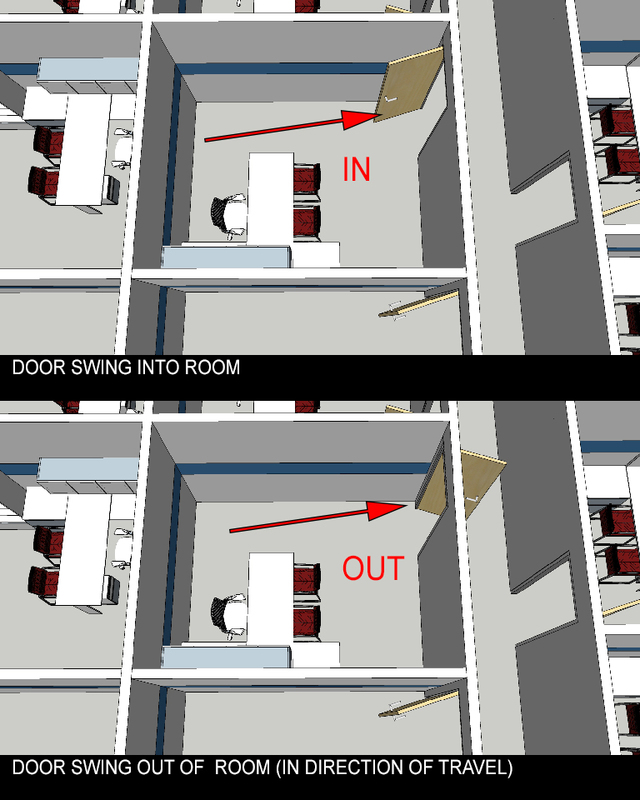 Below is a graphic showing door swing IN versus OUT. There are sliding doors, roll up doors, revolving doors, however ‘most’ of those do not meet code requirements. I say ‘most’ because there are some exceptions and some manufacturers who have come up with creative solutions around this issue. Note in the graphic above, the door swinging out or into the hallway would block circulation. There is code requirements for clear hallway width, which will be discussed in upcoming blog posts. In this scenario, swinging into the office was preferable. Each office was small enough to allow doors to swing in. Private garages, office areas, factory and storage areas with an occupant load of 10 or less. 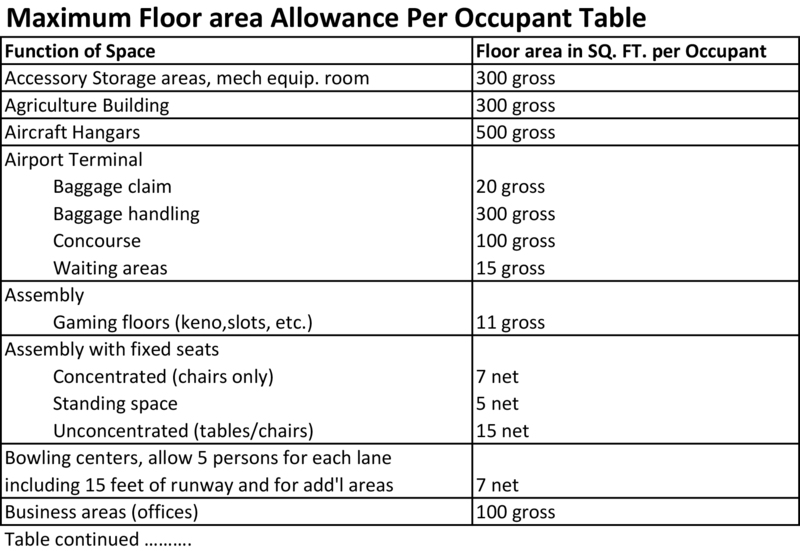 Number of occupants is determined by Occupancy type. For instance, the code has a table which calculates the number of occupants per s.f. For example, an office space of 4,000 s.f. would have an occupant load of 4000/100 or 40 occupants. See example below. When occupant load is 50 or greater, doors shall swing in direction of travel or ‘out’. In the example below, each office may have less than 50 occupants. Those individual office doors swing in. The accumulation of all office occupants however exceeds 50 occupants. 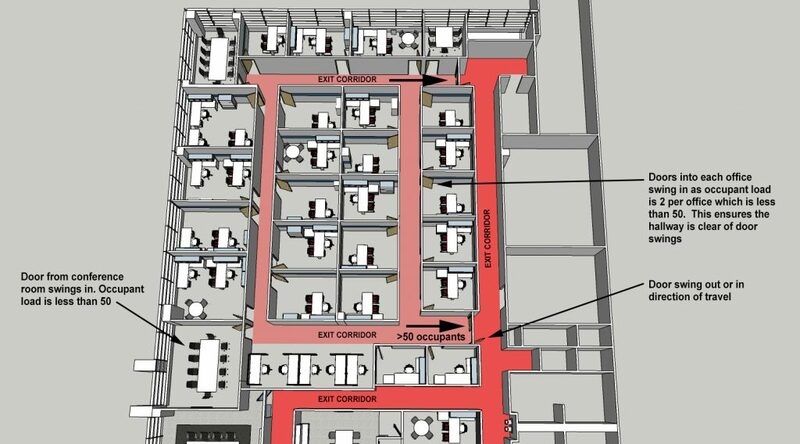 The door out of the general office area to the main exit corridor (in dark red) would need to swing ‘out’. Other factors such as hazardous conditions can dictate the swing of a door. For example, within an electrical room, when the overall power exceeds 1200A, doors must swing in direction of travel. What is the reasoning for swinging doors in the direction of travel in larger occupant loads or hazardous conditions? Imagine you are at an event with over 50 people and an emergency occurs, such as a fire. If you are the first person to reach the door and all 50 people rush in panic to the exit door at the same time, it would be difficult to swing the door towards yourself. Everyone would be pushing to move forward and out of the space. Therefore, swinging out would be easier to open. The code is created, reviewed and modified from years of learning from past mistakes. When learning building codes, once you begin digging into the code, it begins to make sense. In regards to door swing, swinging in the direction of travel or outward will work for all conditions in the code. However when it is not required, such as in a small office, storage room or bedroom, functionally it may make sense to swing into the room. Look at how many occupants are within the room and determine if the room is a hazardous condition. When in doubt, rely on an Arizona Architect to explore the code and assist you.